Suitable for connected with washing machine or mop pool, double cross handles independent switch. 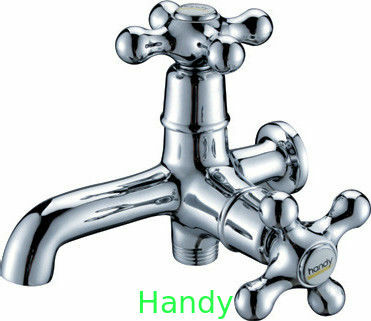 High purity brass main body, resistance costing, single hole wall-mounted installation. With G1/2 inch washing machine special connector in outlet.Ceramic cartridge, Quality guarantee time:5 years no leakage. The temperature is no more than 85° when supply hot water. Don't use vapor when supply hot water.